Halliburton's most recent conference call had some essential industry insights in it that every energy investor needs to know. 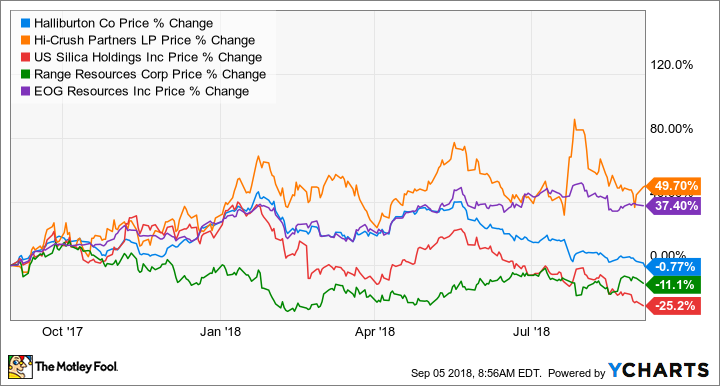 If you want to take the pulse of the North American oil and gas market, one of the best places to start is Halliburton's (NYSE:HAL) quarterly conference call. As the largest oil services company in North America and with clients of all sizes across every shale basin, management has an intimate knowledge of what is going on in the oil patch at any given moment. Listening to, or reading a transcript of, Halliburton's quarterly conference calls can give investors insights into the market that can help steer investment decisions. Here are a few important snippets from the company's most recent conference call that could help you make informed investment decisions. With the expected activity in the second half of this year, we're mindful of the impact of cost inflation from trucking and increased maintenance expense. The use of trucking for sand, water, and crude oil is generating intense demand for trucks and truck drivers, thus creating cost inflation. We manage trucking costs through the use of containerized sand and integrated logistics helping offset inflation. One of the beneficial side effects of the recent oil price crash was that it drastically brought down oil services costs. There were loads of available equipment and crews bidding on a limited amount of work. In many cases, companies like Halliburton would offer huge discounts to producers for the sake of maintaining market share and keeping some equipment active. It allowed many producers to lower the cost per well drilled and made them more competitive in a lower-price environment. That isn't the case in many parts of the country anymore as capacity constraints and labor shortages are making everything more expensive. That's bad news for producers because it likely means that break-even costs will increase. However, those that can introduce ways to improve efficiency will likely do quite well. One example Miller mentioned was containerized sand, a concept spearheaded by two frack sand producers: U.S. Silica Holdings (NYSE:SLCA) and Hi-Crush Partners (NYSE:HCLP). These companies have developed sand hoppers that reduce last-mile shipping and loading times by more than 75%. This translates to significantly fewer trucks needed to move the same amount of sand and less downtime for producers. Both companies are seeing strong demand for the service, and it translates to much higher margins per ton of sand sold compared to their peers. Innovations like this and companies looking to develop technologies and systems to improve efficiency these days are going to do incredibly well in the coming years as every part of the supply chain for equipment and services is likely going to be strained. Will pipeline capacity constraints kill the Permian Basin? There's much talk in the industry about offtake capacity. But during the last few weeks, I visited with customers in the Permian, and they don't look like a group that's backing down. I can see it in their eyes. They feel good about where they are and how they're positioned for the long run. Don't underestimate this group. They are competitive, will figure out how to deal with constraints, and will adapt. Don't get me wrong. I'm not naive to the math around the offtake issue. But as we've seen so far, our customers will not all react in the same manner. There are customers that have moved their focus from one basin to another, and we're there pursuing that work. Other customers plan to reduce activity over the short term or are adding fewer rigs than expected. The news topic du jour in the shale patch is the lack of pipeline capacity, especially in the red-hot Permian Basin. Production has been growing faster than companies can lay pipe to bring it to demand centers such as America's major oil trading hub in Cushing, Oklahoma, or the Gulf Coast. The few companies that have available space are making a killing as transportation costs are high. Producers, though, have come to the stark realization that it's really hard to sell crude oil without a demand destination. While Miller's comments about a resilient industry sound encouraging, investors should take a pause here to assess the situation. We faced a similar situation several years ago in less developed basins such as the Bakken. EOG Resources pioneered the idea of moving Bakken crude via rail as a way to deliver crude oil to markets where pipelines didn't exist, such as the East and West coasts, but eventually, production in the region was so reliant on rail that some producers were moving as much as 80% of their production via rail. The problem with rail is it is more prone to accidents and is much more expensive than pipelines. So even if rail shipments out of the Permian become a reality, it may not necessarily translate to higher realized prices for oil in the region. There are plans in the works for several new Permian to Gulf Coast pipelines, and once operational, they will alleviate much of this issue. In the interim, though, investors should be prepared for producers to tap the brakes on production growth. In fact, it would be encouraging to see producers do so because it would show that they are prudent capital allocators. Those that start looking for more creative ways to move product are likely going to take on more trouble than it's worth. "A victim of our own success"
The Marcellus is beginning to see some softening in activity as our customers hit their production targets earlier than planned. In some ways, we're a victim of our own success as we develop longer laterals with better production. As a result, we expect this area to have temporary softness in the back half of 2018. Perhaps the only place that is more capacity constrained than the Permian Basin is the Marcellus shale in Pennsylvania. Unlike the Permian, which has been a prolific oil production region for decades, the Marcellus region is much newer and there was little to no legacy pipeline infrastructure in place. What's more, the Marcellus is a natural gas formation. If you thought moving crude oil without pipelines is hard, try doing it with natural gas. The fact that two of the most prolific shale basins are running up against infrastructure constraints should tell investors two things: (1) Don't expect much from producers, and service providers concurrently, for a while until new pipes get put in the ground; and (2) there are ample investment opportunities in the pipeline and logistics business.